Located in the Main Lodge below the restaurant is the snug, but outward looking Yosemite Health Spa. It’s valley view garden deck with tables and lounges is great for summer tea and winter apre’s-sauna strolls. The stainless steel oxygenated spring water hot tub that opens upon the deck is the best viewpoint. Plan for yoga, massage therapy, aromatic herbal baths and the hot rock sauna to make it a relaxing and lovely visit. Accessible parking, ramps, bathroom and assisted lift are available. Hot tub edge is transfer height. 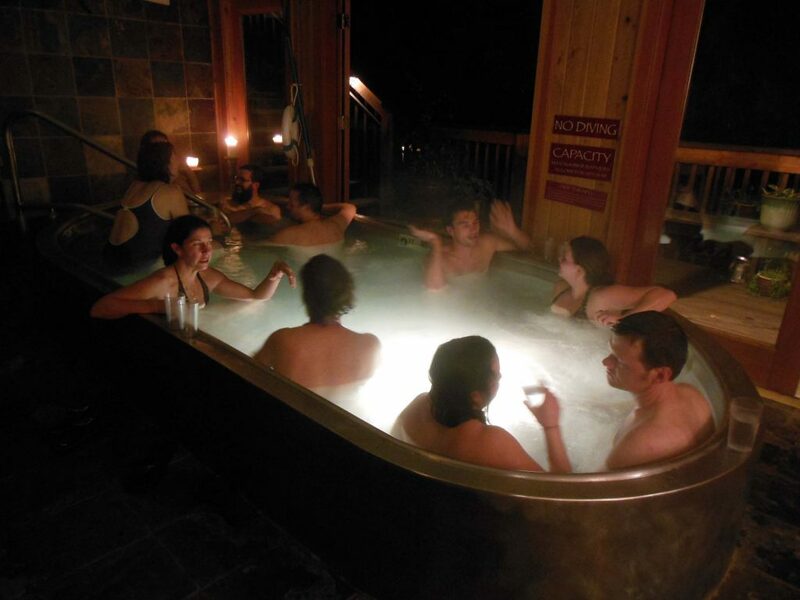 Our hydrogen peroxide and UV light hot tub is cleansing and oxygenating, like having a third lung. Large capacity and stainless steel, it looks out into the gorge, the mountains and forest. Whether sunny or snowing it is a fantastic part of your day. The cedar hot rocks sauna has a eucalyptus or lavender infused water bucket to ease deep calm breathing to help you perspire and cleans your body. Take a rain shower just outside and stroll the deck to cool between sessions. 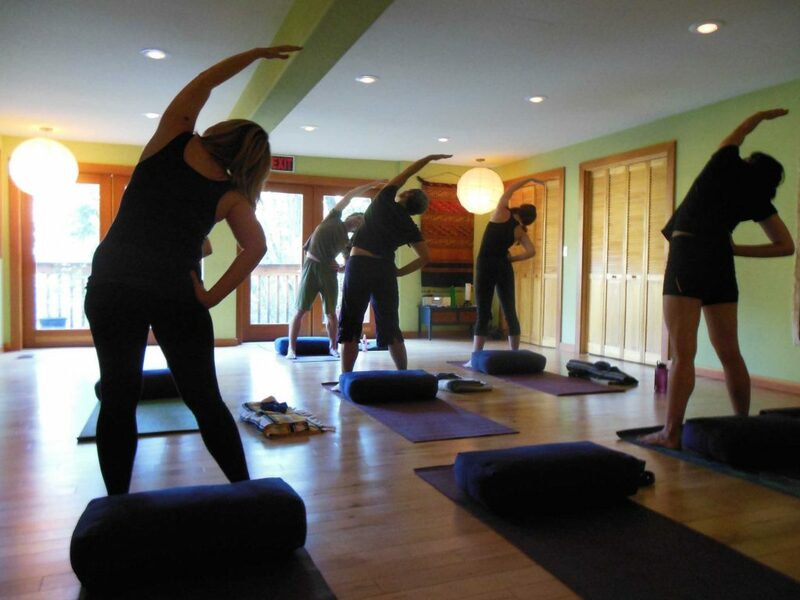 The yoga studio is there for your own yoga or stretching routines with our mats, blocks, ball, cushions and blankets. Use the body shower panels in the changing rooms to shower before and after with quality body cleaning products to feel great upon departure. You can also use the yoga room for you own program when classes are not in session. Extra suits upon request, too with your large towel. What every visit should include is a relaxing massage or rub to allow your anxieties and busy life melt away. All treatments include a day pass. 10am – 10pm by reservation. We have spa attendants you can book with after 2:30pm at extension 4 or contact the reception in the morning at ext 1. Nice Japanese and Tibetan inspired therapy rooms with candles, music and robes to enjoy a Swedish or deep tissue massage from one our our certified therapists. Each has a specialty but they are all wonderful and calming. A day pass in inclusive so relax in the sauna or hot tub to yourself pliant beforehand. All week we have a therapist near at hand but we always recommend booking in advance. Relaxing light to medium pressure massage helps relieve stress and anxiety as well as soothes tired aching muscles and joints. A deeper pressure Massage aimed at injury recovery and relieving chronic pain. Combines deep pressure, stretching and the use of our anti inflammatory oil blend. After a brief intake to address you specific concerns, your therapist will utilize a blend of massage techniques with light to firm pressure to melt away the stress of the world. Our custom massage includes 2 hot stones,moist heat compress and your choice of aromatherapy. This massage utilizes warm oiled river stones to bring soothing therapeutic heat to tight overused muscles allowing for deeper pressure to melt away any aches and pains from strain and overuse. Gentle therapeutic bodywork that focuses on the special needs of the mother to be as her body goes through the dramatic changes of pregnancy. The gentle approach of prenatal massage can ease discomfort associated with pregnancy. This rejuvenating reflexology treatment, featuring cooling peppermint, begins with a foot scrub to remove the travel dust followed by a foot mask and hot towel wrap to soften and hydrate, while your feet are wrapped up you receive leg, hand, arm, neck and head massage. Your feet are then unwrapped and you receive a long reflexology foot massage. This treatment will leave you relaxed and ready for your next adventure. Aromatouch technique will maximize the benefits of the essential oils used, stimulate the body and energy centers and help balance body systems and function. Your locks will be drenched in warm coconut oil infused with a blend of essential oils to nourish your hair and scalp while you receive a long relaxing head and neck massage. This nourishing treatment replenishes hydration and leaves your skin glowing and refreshed. Includes cleansing, light exfoliation, mask application and locally made nourishing skin serum. This treatment starts out with dry brushing to open your pores and increase circulation, followed by a body mask application, choose from Detoxifying Herbal or Seaweed Toning. You will be wrapped in a warm cocoon while receiving a relaxing scalp massage, this treatment ends with a hydrating body butter application. Jon Paul makes beautiful, supportive and calming sessions each weekend worth the time from you busy adventure schedule. 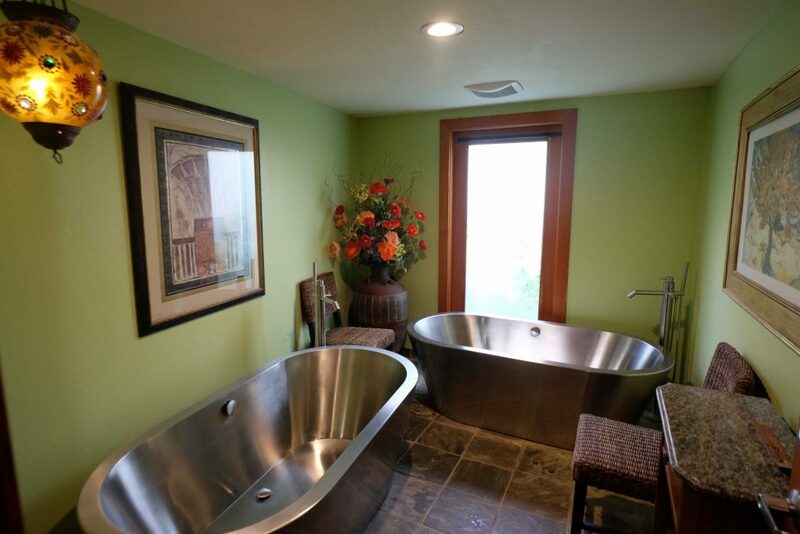 These bath are in a beautiful tub room with two stainless steel soaking tubs, music and essential oil aromatics to fill your lungs and body. This ayurvedic therapy breaks through the blood/brain barrier to offer specific healing properties such as sickness, fatigue or mood. Soothing mineral salts with eucalyptus, sweet orange, and lavender essential oils for fatigued or injured muscles. Mineral salt blend, with uplifting tangerine, lavender and chamomile essential oils for wellness and fatigue. Custom, locally crafted herbal formula created to cleanse and moisturize the skin, detoxify the body and ease stressed muscles. Includes lavender, lemon and clary sage essential oils steeped linen herbal bag for exfoliation.